Zaytoon Mediterranean Restaurant and Bar offers Mediterranean comfort foods with a modern American twist. 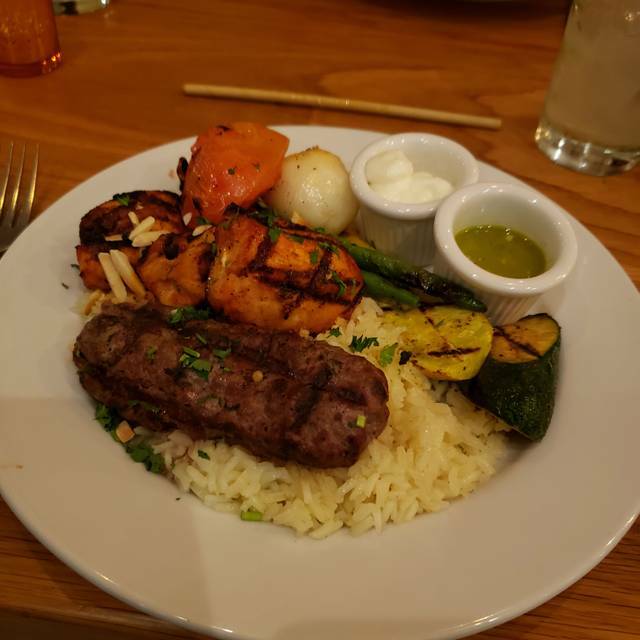 Located at the corner of Solano and Kains, Zaytoon embraces the everyday Mediterranean kitchen, making it the focus of your casual fine dining experience. With hummus inspired by the flavors of Jerusalem and humanely raised meats, Zaytoon is much more than your average shawarma joint! Come try Zaytoon’s craft cocktails, created by the Jessica Maria, the owner of Albany's craft cocktail bar, the Hotsy Totsy Club. Meet up with your coworkers or friends for Zaytoon's full bar and Happy Hour! Reserve a table for your romantic night out. Zaytoon is consistency with food, bar, service and atmosphere is always great. I always take guests there for happy hour and dinner. We were a party of 6 people. Per our request we were sat in a quiet area. All 6 of our meals were outstanding. I wish this restaurant was in the Southbay! Delicious Lebanese food, very nice wine list, and warm, attentive servers. The only slight down side is the noise, and while the furnishings give a crisp, clean feel, it could be more comfortable. 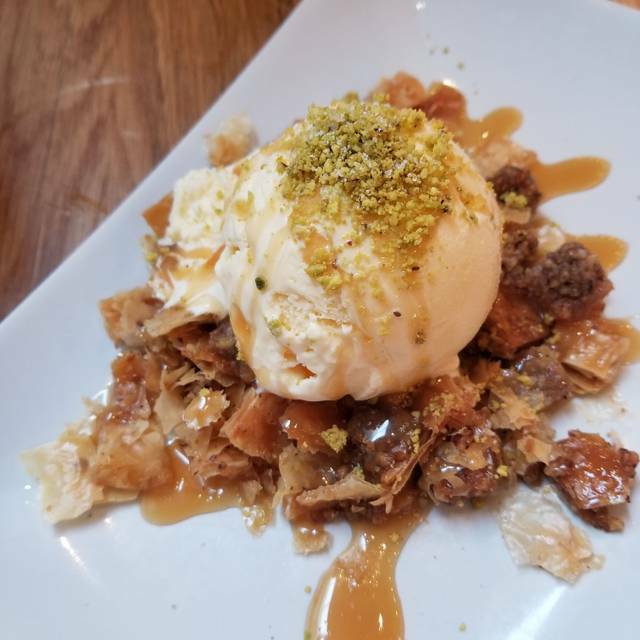 If you've got a sweet tooth, the baclava and ice cream dessert is a must. Best restaurant. I loved the Lebanese red wine. All the dishes and service was amazing. I’ll be back over and over. The service, food and atmosphere are wonderful! Fresh lovely space and decor, beautiful wooden tables and chairs. Hard surfaces mean that the sound is loud to make talking difficult at times. Lots of attention paid to each dish - 5 stars for fresh clean tasting food. The salads had emphasis on green green green, with not a lot of variety (in other words, more greens than other interesting additions), a little out of proportion. But still delicious. Lamb and kefta moist and tender. Pearl couscous delightful. Delicious Malbec. We were a party of four with a reservation and were promptly seated at arrival. Service was very good and our server was friendly and warm and knowledgeable. We’ve been here before so we know what to expect. The portions are not big, but the dishes are well done for the most part. Value isn’t why you dine here. It’s more for the ambiance and comfort. If you have questions about the menu I would suggest you ask about any dishes to be sure of what you are ordering. They have a bar and Happy Hour applies only for the bar so if you want to try it out, I would suggest you go to the happy hour and have a few drinks with a few menu items and you will feel you’re getting a better value. The food was exceptionally well prepared: a first course of Arabic cheese (beautifully seasoned) with warm pita, followed by chicken skewers with grilled vegetables over pearl couscous and an “upside down” chicken with stewed tomatoes and vegetables. The kitchen knows what they are doing! We shared an arugula salad which was very amble and then had a chicken kabob and cauliflower over rice. All were excellent. Their cocktails are very good. I Han a glass of their Zinfandel which was also excellent. Wonderful service, lively restaurant, food was decent. The spanakopita was the second-best I'd ever had, but the moussaka was a bit dull. We liked the vibe enough to put it on our regular rotation when we're in town. The food was very good and had a good portion size, the service however was very lacking. We had to remind our server to bring our drinks, food, etc. The food is excellent and the service great. I love the shrimp and scallop dinner and my husband loves their fried fish...he doesn’t usually like fish but they go such a great job he loves it. The desserts are also delicious especially the sundae and the baklava bits with ice cream. We didn’t have the spanokopita but it is fantastic! Nice atmosphere for prepared Mediterranean food. Nothing outstanding to recommend. Hummus appetizer was very good. Lamb kabobs ere good but lamb could have been more tender. Friend had beef kabbobs which were better. Nice neighborhood place with friendly staff and the hostess is lovely, helpful and attentive. Portions were generous, but the food lack much flavor. Service was good. Not a good value for the price. Excellent Middle Eastern food. The baba ganoush is the best I've ever had. Not an innovative, Berkeley-style creative menu, but excellent version of the classics, served in a nice space where you can talk! We booked a 915 reservation. We arrived on time, sat down at a table, and were told the kitchen was closing in 5 minutes. We were rushed through the entire meal, and were basically asked to leave 45 minutes after we arrived. They should not be posting availabilities at 915, if they know they will be rushing towards a 10 close of the restaurant. As always, the food and the service were wonderful. My only caveat is the noise level--it is often too loud for us to hear each other across the table. We chose to be seated inside because of the weather but recommend sitting outside among the trees w twinkling lights or the seating around fire pits. Learned there is music too but there wasn’t the evening we went. Food is good, unusual for an area dominated by California and Italian food. The restaurant is directly behind the Spanish Garden Inn, where we stayed. Perfect!! Well-prepared food, good service, and food arrived timely. I will frequent this restaurant again. I do hope the menu will reflect the change of the season. All good - food, service, ambiance, and price. All 5 of us praised the food and the service. Prices are very reasonable. Friendly, lively atmosphere. Excellent Solano Ave./Albany neighborhood Mediterranean restaurant. All dishes nicely prepared, good sized portions. Menu has excellent variety without being overwhelming in size (so they do what they do well). Good for mixed carnivore/veg family like ours. Nice bar with good wines, reasonably priced, that pair well with fare. Hint for those with moderate appetites: order kabob plate with an extra kabob and take half home for a great lunch. Ive been to Zaytoon four times. I have always really enjoyed it. However, I was a little disappointed in my mousakka on Sunday night. Seemed less flavorful and rich tasting than in previous visits. My wife said the same thing about her dinner. Still great service, nice atmosphere and a good value. Hoping it was just an off night. Portions are plentiful but food is bland. I added salsa to my leftovers, which brought ingredients alive. Thank you zaytoon for always accommodating us. Even with kids in highchairs we are still made to feel wantes. Food is always gorgeous and tastes incredible. As always Zaytoon was great. It never disappoints, you can count on having a good meal, good service and pleasant ambiance. Delicious food and ambience - new favorite place in Albany! Great service, well prepared food. Nice ambience. Having enjoyed Zaytoon when it was a small space near downtown Berkeley that was open only on weekends, I was looking forward to my meal at the expanded location. It was a very disappointing experience, primarily from a food standpoint. It's clear that the owners have dumbed-down the authenticity of the dishes on their menu to suit the near-suburban demo of their new location, but jeepers, this is Berkeley ... they didn't have to do that. The restaurant is only a couple of blocks from one of the most authentic Szechwan restaurants in the country, which is always packed. If Zaytoon were one's introduction to Middle Eastern food, I suspect one would never try it again. I had two plates: a starter of the most flavorless hummus I've ever tasted (well-prepared but completely unseasoned), and a fatoosh salad that was mostly lettuce, with a few small pita chips scattered around, and a dressing so innocuous that I had to ask a server if it had been forgotten. I was brought a small ramekin of the dressing, which was basically neutral salad oil with some herbal flavoring and a hint of citrus juice. I then had to ask for lemon wedges to give the salad any acidity at all ... .but by then it was soggy from the oil, and completely inedible. Wine prices are also way too high, but that's true everywhere these days. It's a pleasant if noisy room when packed, but the food is a real disincentive to return. I went here with three friends and everyone enjoyed their meals. One friend selected an unusual cocktail that was very good. I've been here twice now. Although the ambience is a little cold to me, the food is solid. This is our third time at Zaytoon and it’s quickly becoming a favorite. The food is a good combination of classic Mediterranean with some unique twists, and always perfectly prepared. Cocktail menu is interesting and innovative; the staff treat you warmly and like family. Zaytoon continues to be one of our very favorite restaurants. It was great to celebrate my birthday there with friends!